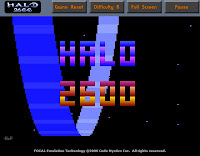 Ed Fries, the once vice president of Microsoft's game publishing division – and the man who had his hand in signing Bungie Software as a Microsoft first-party developer – has returned to his old-school roots with a brand new game: Halo 2600 for the Atari 2600, which premièred at the Classic Gaming Expo in Las Vegas this weekend. Fries no longer works for Microsoft, but he has a long history in gaming: he was responsible for programming several games for the Atari 800 computer system more than 20 years ago. Halo 2600 is his first attempt at creating a game for the Atari Video Computer System, a console released much earlier than the 800, and considered a beast to program for due to its heavy restrictions and limitations. I played it for a bit, and it's a blast. It controls just fine with the keyboard, and even has two difficulty options, as if you were playing on a 2600. There were only 100 cartridges made, all of which were presumably sold, so anyone who wants a cartridge should expect to pony up.